Music unlocks ideas. I love writing beginnings and endings but middles test my patience. Once I know how a story is going to end I just want to be there already, which often results in me taking extended breaks from what I’m working on. I don’t put on certain music trying to coax out the missing puzzle piece, it just happens. 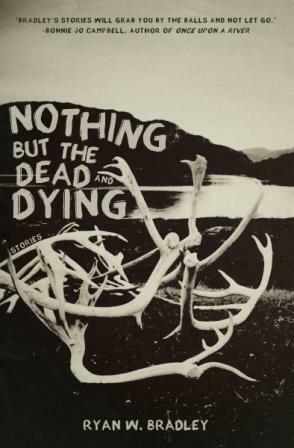 The original version of Nothing but the Dead and Dying was named after a different story in the collection, Glaciers. But sometime into the process of sending the manuscript to agents and editors another book called Glaciers came out and the more attention it got the clearer it became that I would have to change my title. I was driving home from work listening to Simon and Garfunkel when My Little Town came on. It’s my favorite song of theirs, primarily because of the point where it stops being soft and the music builds aggressively and the lyrics get increasingly dark. Suddenly this little town isn’t idyllic and that’s where it gets good. That’s the meat. I’ve listened to the song hundreds of times, but on one occasion a particular line grabbed me as the title. I reflexively checked the name of the song because I couldn’t believe they hadn’t used it. If a single phrase could possibly encapsulate the stories I was trying to tell of blue collar people and towns in Alaska, this was it. I instantly knew I had the new title for my book, and subsequently one for a story I’d been working on set in my home town, Wasilla, certainly a town full of bleak desires and dreams. One of the bands I revisit most often is Morphine. Their songs are a little bit Beat and a little bit Noir, they are soothing and catchy. And there are more than enough turns of phrase and lyrical tidbits that serve to inspire the writing-minded. Though the story I named after this song shares very little with the song itself, it’s a testament to the power of earworms. Morphine is a band that sticks with you, and those are the bands whose influence becomes invisible over time. When I worked in the Arctic our job was to be invisible. The goal was that when we finished our projects a stranger wouldn’t be able to tell we had done the work in the first place. This is not so different from how the world around us becomes part of what we create. The music, films, books, and art—not to mention the people and places—that stick with us become a part of what we in turn create. Whether we realize it or not. Usually my writing is tied to what I was listening to while writing it. But the stories of Nothing but the Dead and Dying are more about what I was not listening to. Because they were written over such a long period of time (roughly six years from the first story to the last), there’s no way to quantify the music that created the fabric of the process. In fact, this book, more than anything else I have written, may show the least musical influence. But like a glacier, what we see on the surface is only a small portrait. Writing this book was about tone from the very beginning. It was about feel. As soon as I decided to put together a collection of stories about blue collar Alaskans (which was after writing just three or four stories), it was clear that they would be bound by an environment, one far beyond the landscape of the state, deep into the psyche of its inhabitants. I rarely listen to classical music or music without vocals in general. I need the voices and the words. I need songs that move fast. If you want to know my favorite song on an album it’s usually going to be either the most up-tempo song, or the one that sounds most Beatles-esque. When it comes to classical music one of two exceptions is Ennio Morricone. Morricone could set a mood with music in his sleep. His film scores create barren landscapes full of violence and loneliness. If I were charged with finding a musical equivalent of my stories, there’s no doubt it would be one of Morricone’s scores (here, The Good, The Bad and the Ugly). I can hear the ominous notes resounding in every sentence, every glimmer of hope a character is given, and the emptiness of the hopes removed. Allow me to be a cheater. They may not be songs or albums but voices are musical. They can stick in your head just like songs, they can inspire your imagination, or make you feel any of the emotions a strong note or lyric can. In the end my writing boils down to a voice and it is that of actor Sam Elliott. I am obsessed with some people’s voices, but none more than his. I hear it in my head when I write. It helps me craft the tone of my sentences. When I revise, I read out loud and I do it in a Sam Elliott impersonation. The words are different in his voice, I experience them in a different way and it affords me a chance to feel them as foreign objects. I am not repeating myself, but removing myself. I am allowed to be some version of an audience. Putting words down on the page, stringing them into semi-coherent sentences and paragraphs is not hard, but it couldn’t possibly be harder. This is why writers have rituals and routines. We find a way to make the writing a little easier and we cling to it. I don’t need to create a mood to write, but what I do need is a key. Music is a key. It can feed an idea or expand it. Music helps me focus, the way that doodling while in a meeting does. People joke about getting their best ideas on the toilet or while in the shower, for me that is, more often than not, listening to music while driving to and from work. Writing is easy. Until it isn’t. But I’ve found that when I’m the most lost, when I put a story aside and wonder if it’s even solvable, it is a song at some random time and place that will make the pieces come together. This entry was posted on February 3, 2016, 7:13 am and is filed under Undercover Soundtrack. You can follow any responses to this entry through RSS 2.0. You can leave a response, or trackback from your own site. Roz, thanks for another undercovering.